One of the largest financial outlays for most taxi drivers other than fuel and the vehicle they drive, is taxi insurance. The initial startup costs of becoming a taxi driver can be high and can often leave an individual well into debt, even before they have collected their first fare. This guide answers many of the taxi insurance frequently asked questions along with tips for keeping insurance costs down. Anyone who drives a taxi (hackney carriage, black cab, public hire), or private hire (minicab) for reward, will need specific taxi insurance. Your personal domestic car insurance, or business car insurance if you have it will not legally cover you. 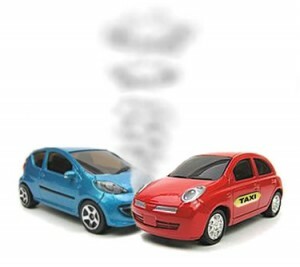 Due to the nature of taxi driving, significantly higher mileage is covered annually compared to the average car driver. This means that statistically, a taxi driver is more likely to be involved in a traffic accident. Therefore insurance providers charge higher premiums that reflect the higher risk. As with domestic car insurance, the amount you are quoted ranges significantly and factors in age, location, type of vehicle, previous motor insurance claims (if any), no claims bonus (if any) and any motoring convictions that have yet not expired. As with any form of vehicle insurance, young drivers statistically represent the highest risk to insurers. An individual wishing to gain taxi insurance who is 21 years of age and is an inexperienced taxi driver (a taxi licence is granted only to those between the age of 21 and 70), is either unlikely to find a provider willing to insure them, or will be quoted so high that outgoings would far exceed income. For those aged 25 and over, things start looking better, though expect to pay far in excess of usual domestic car insurance. On average, you can expect to pay anything between £2000 to £4000 per annum for taxi insurance. Public Hire Taxi Insurance – This is the black cab hackney carriage taxi which allows you to stop and pick up passengers from the street. Private Hire Taxi Insurance – Private hire minicab drivers can only take passengers from booked appointments, often made through your operator. Other forms of insurance may include temporary taxi insurance, minibus insurance for those with larger vehicles and fleet insurance for those with multiple vehicles. There are often add-on’s to vehicle insurance policies with some being less necessary than others. As a taxi driver, you will be working with many members of the public. If anything goes wrong, you may wish to consider an insurance that covers you financially against being sued and found culpable by a court. Public liability insurance is an add-on that protects an individual financially. No claims bonus (NCB) – Even if you have little or none, a NCB can steadily build up to 75% providing you with huge discount potential. Careful driving is of course essential. You may consider a NCB protection add-on to your policy and though this will protect it, your premium will still increase in the event of a claim. When your vehicle is not in use, parking off-road or better still, in a garage helps to reduce the potential of theft and as a result helps to reduce premium fees. Opting for third party only insurance may offer the cheapest quote, though this isn’t always the case and can in fact be more expensive with some insurers. Whilst obtaining quotes, gain quotes for all three; third party, third party fire and theft and comprehensive. Policy-only option is likely to provide the cheapest quote, providing that is it meets your needs. The higher the excess (the amount you will need to pay in the event of a claim), the cheaper your insurance will be. Choosing to pay by monthly installments is an option insurers like as they add up to 10% on top of your quoted premium for the privilege. If your premium is £3000, that’s an extra £300 you’ll end up paying. Stumping up £3000 might not be an option for some, so it may be worth looking into a 0% credit card to pay for your insurance in a single go. It is important to ensure you clear your credit card before the 0% terms ends, else it will likely end up costing you more. Alternatively, sourcing a 12 month loan with lower interest rates than the insurance may prove beneficial. Install extra anti-theft and security devices such as CCTV may decrease quoted premiums with certain insurers.